Product prices and availability are accurate as of 2019-04-18 15:02:22 UTC and are subject to change. Any price and availability information displayed on http://www.amazon.com/ at the time of purchase will apply to the purchase of this product. Give road-weary eyes a break with this spiral-bound Large Scale edition featuring all the accuracy you've come to expect from Rand McNally, only bigger. 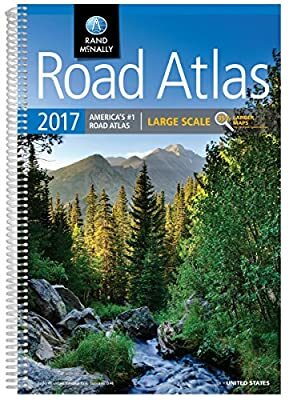 Updated atlas contains maps of every U.S. state that are 35% larger than the standard atlas version plus over 350 detailed city inset and national park maps and a comprehensive, unabridged index. Road construction and conditions contact information for every state conveniently located above the maps. Contains mileage chart showing distances between 77 North American cities and national parks with driving times map. Tough spiral binding allows the book to lay open easily. Reference_Book_Type - Atlas Number_Of_Pages - 264 pages Binding - Spiral-Bound Width - 10 3/8" Height - 15 3/8"